"Vicki Anderson (born Myra Barnes) is a soul singer best known for her performances with the James Brown Revue. She recorded a number of singles under both her birth and stage names. She is acknowledged by James Brown in his autobiography as the best singer he ever had in his revue, and probably the best singer he had ever witnessed. 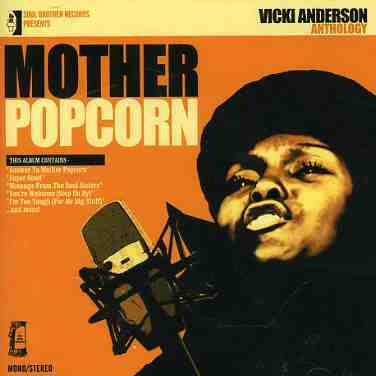 She is the widow of Bobby Byrd (the original founder of The Famous Flames) and the mother of Carleen Anderson. Vicki joined James in 1965 replacing Anna King, and stayed for three years as his main female singer, until replaced by Marva Whitney in 1968. She rejoined in 1969 after Marva departed, staying for a further three years until 1972, after which Lyn Collins took over from her. In 1970 she released her most famous song, the feminist anthem 'Message From The Soul Sisters'. A single on James' I-Dentify label by Mommie -O appeared in 1975 featuring a cover of Rufus' hit 'Once You Get Started' and Bobby Womack's 'Stop On By' (which had recently been covered by Rufus). Vicki married James Brown's right hand man Bobby Byrd in the mid sixties and is the mother of UK Based Carleen and Jhelisa who both came to prominence in the 90's with a couple of strong albums each. Vicki toured the UK with the James Brown Funky People Revue in the late 80's and again with husband Bobby Byrd in the mid 1990's."